Many members of the Destiny Council and the Minnesota destiny community in general recently made the drive out to Fargo for the regional that occurred this past weekend. I (Jon) decided to take a favorite deck of mine: Thrawn Talzin. I won’t go into too much detail about the tournament itself but I will say a few things. First, I was second after the 7 swiss rounds (6-1, I somehow managed to play FOUR OTKs in swiss…..) . Second, I made top 4, and had a real shot at making the Final and/or winning. However, Fantasy Flight had put me in an interesting position by sending out the World’s lottery results the day before. I knew that I had been accepted, and that Will Klein, a fellow team member and my top 4 opponent, had lost the lottery. With this in mind I conceded my top 4 match, not wanting to take away his chance at a World’s seat. All that to say that the deck performed exceptionally well. 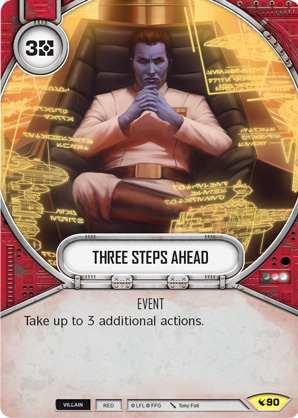 So the question is, can a Thrawn deck really be tier one? I’d say yes, and I hope this article can help highlight why. So how on earth did I end up playing these characters? It really boils down to a couple of factors. 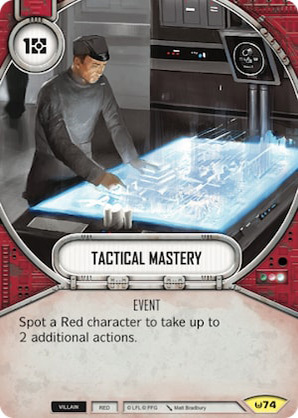 First, I’ve spent much of my testing and exploration in Legacies working on Talzin decks. Her consistency, coupled with the insane card that is Witch Magick just kept me searching for the best deck possible for her. Eventually I had the epiphany that Talzin’s and Thrawn’s abilities together make for an enticing combination. 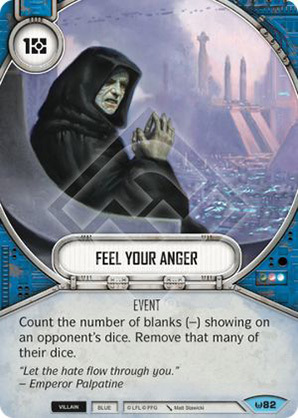 Thrawn is best used (at least in my opinion) to reduce an opponents control options. If you call 0/1 each turn (depending on your opponent’s deck / current resources) you can effectively reduce their deck from containing 8-10 control cards to 3-5. This degree of protection for your dice is insane. 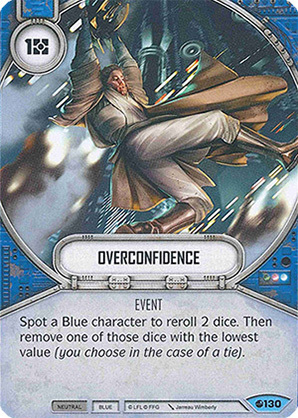 In most games you’ll find yourself with at least a turn or two in which your opponent has no control cards after Thrawn activation, and in the other turns they’ll only have one. Talzin on the other hand excels at guaranteeing powerful dice sides. It is this potent combination of ensuring you roll the sides you want, while also guaranteeing your opponent can’t interact with them, that makes Thrawlzin work. First we’ll examine the upgrade suite. 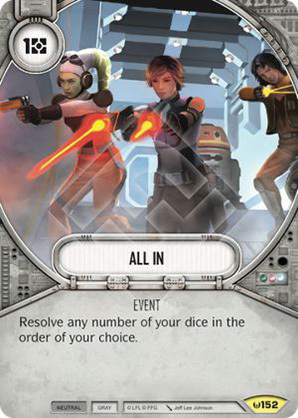 Our 1 drops are what we are looking for on turn one, include a single Crystal Ball, DH-17, and Imperial Discipline. 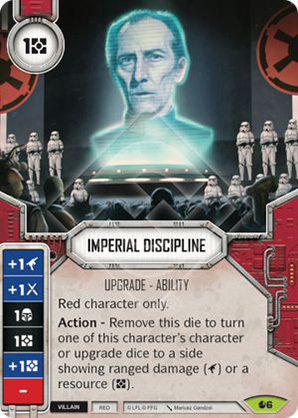 Imperial Discipline is simply insane with Thrawn and is incredibly good early game with its ability guaranteeing Thrawn’s 2 resource side. DH-17 is simply the cheapest form of damage, and getting it turn one improves your damage potential by 50% (4 to 6). 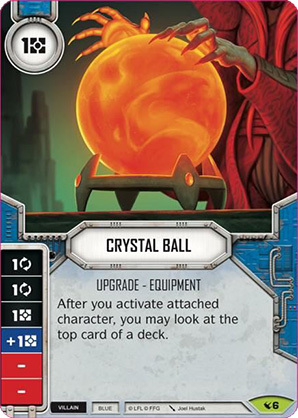 Crystal Ball is another option that can help focus to your Thrawn 2 resource sides, while also helping you with using Talzin’s ability against your opponent, or simply giving you 1 guaranteed card to target with Thrawn’s ability next turn. 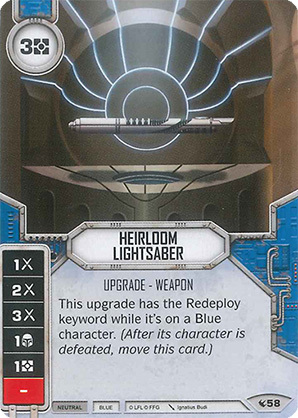 Our 3 drops include Heirloom Lightsaber, Riot Baton, Force Wave, and a single Rocket Launcher. If we could guarantee that we drew our Riot Batons and Heirlooms at exactly the right time, we wouldn’t be running the other 3. Heirloom and Riot have good damage sides, but more crucially redeploy. The other three are only there to be played early if we aren’t drawing the redeploys. Thrawlzin simply doesn’t have enough damage on its character dice, so you have to run enough upgrades to guarantee the early draws. 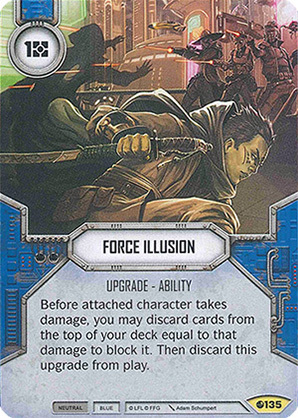 Force Wave is in my opinion the most underrated card in Legacies. Especially now with several 3 wide decks popular in the meta (hero vehicles, hero mill, and OTK) as it has a 6 damage side. Even against the 2 character decks it’s still insane, as most of them have around 20 hp. Being able to deal 25% (5) of their total hp in damage is too much for those decks to handle. While you do have to ping yourself once, you just toss it on the character they aren’t focusing, and it’s usually inconsequential. While Wave isn’t good late game, we won’t have it on the board at that point, as we’ll have already over-written with one of the redeploys. 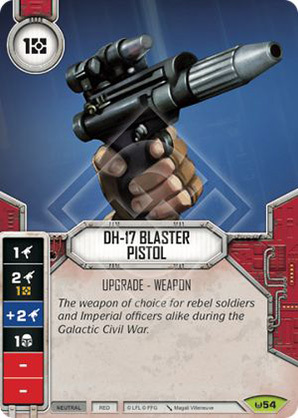 Rocket Launcher is in there simply because it offers high damage and has the option of being played on Thrawn. Next we’ll take a look at our control suite, which is quite impressive. For removal we have 1 Deflect, Feel Your Anger, Overconfidence, The Best Defense, 1 Spell of Removal, and 1 Snare (this is essentially removal). Most of these options are standard, but I’ll highlight a few. We run 2 The Best Defense because the worse case scenario is Talzin dying early, and it’s simply one of the best options we have for saving her. 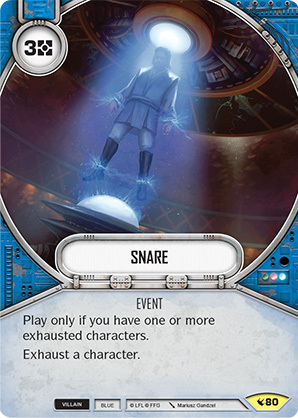 Snare is there simply because when you play the card, you almost always win. While you can be slow, you’d be surprised how many times your opponent will activate the support character first and/or play an upgrade. This gives you time to either activate naturally or play Tactical Mastery activate and immediately Snare. 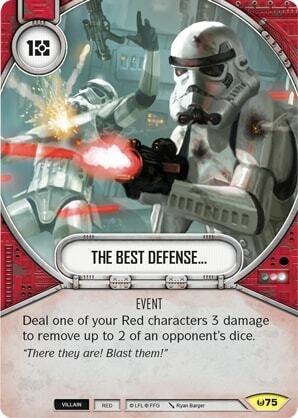 When this happens against a deck like Sabine Ezra or OTK it is simply devastating, effectively removing 3-5 dice. For HP gain/damage block we also have several options. We run Force Illusion, Witch Magick, and Rise Again. All of these are relatively self-explanatory. 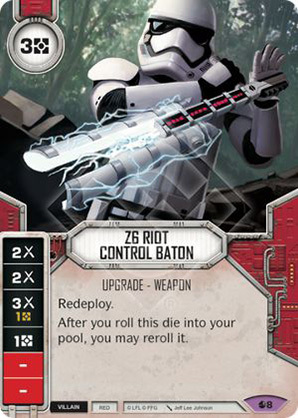 Coupled with our control cards we can bring back Talzin from the brink of death and keep her alive much longer than you would expect. 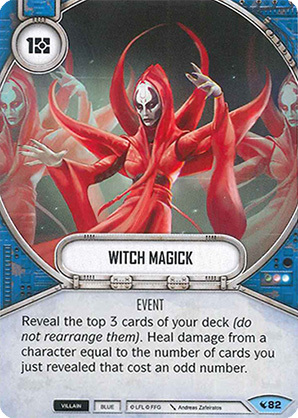 It’s worth noting that Witch Magick is not spot a blue and can heal either character, which is nice when Talzin is dead or Thrawn is our opponent’s first target. Cards like these are what give you a chance against cheat heavy decks like Sabine Ezra, allowing you to preemptively (Illusion) or retroactively (Magick/Rise) deal with the damage. These explosive plays can help close out games and/or finish off characters. So what is the deck good against? What are its weaknesses? Its strengths? I’ll highlight some thoughts briefly. Guaranteeing Thrawn’s 2 resource side for strong ramp. 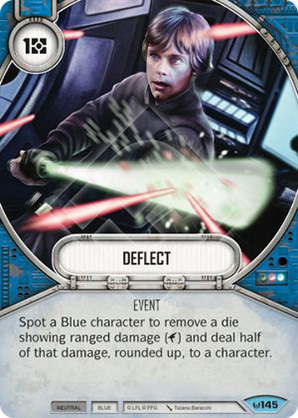 Hitting your opponent’s removal with Thrawn’s ability and playing around their hand each turn. Keeping both characters alive much longer than you’d expect with its heals and control. Maxing out its damage dice every turn. Failing to draw the necessary upgrades. Having Talzin one shot, without a chance for healing/die removal. Mid to long range decks. Decks with low removal counts. i.e. 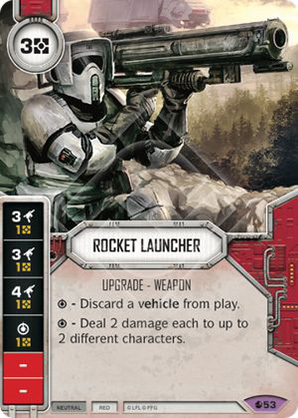 Obi-Maz, Hero Mill, Hero Vehicles, etc. Take all the above observations with a grain of salt. I had to make broad generalizations for brevity’s sake (no one wants to read a 20 page essay on how to play the deck). Essentially this deck does several things extremely well. 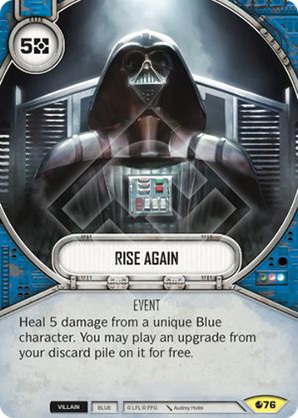 Each game it will utilize Thrawn’s resources to ramp quickly while also affording large amounts of removal and heal. Eventually around turn 3/4 with a fully loaded Talzin, you’ll barely hang on and keep both characters alive through your opponent’s early actions. 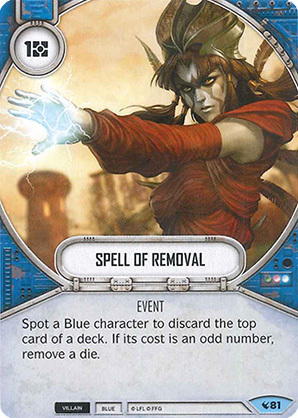 Meanwhile Thrawn hit your opponent’s only significant removal, and you know it. You activate Talzin and turn to Thrawn’s double focus. You re-roll once or twice, then focus the only remaining dice that “missed” to the desired sides. You deal max damage (12+) either winning or killing off your opponents main character. From there it’s almost impossible for your opponent to come back, as you can draw into more heals/removal, and their remaining dice simply won’t be enough damage to even kill one character. Even if they do manage to kill Talzin, 3 redeploys will move over to Thrawn and he’ll be able to close. In conclusion, I believe Thrawn Talzin is definitely a tier 1 deck, and actually performs quite well in the current meta. If there’s one deck that scares me, it’s Sabine Ezra. But even in that match-up, you have a decent shot. Against the rest of the field, I’m quite confident. More than that however, I’m confident that I’m going to win and lose games due to my own play, not the luck of the dice. This is the deck’s greatest appeal, and why I believe there is no ceiling for its potential. Knowing your opponent’s hand each and every turn is incredibly valuable at high levels of play. Add on to that Talzin’s ridiculous consistency and you have a deck that simply won’t perform poorly with random happenstance. Perhaps the only factor you don’t control is your draw order, but with the above list I’ve found the deck to draw extremely consistently. I will give the warning that it takes time to play the deck properly, but I encourage everyone to give it a shot. Hopefully you’ll find similar results, but perhaps I’m simply wrong about the deck. Feel free to give your own thoughts! Nice deck! I’m so used to seeing the Holo version, but never felt as consistent. This appears to be far More so. I look forward to trying it. Great article on an innovative deck with thoughtful discussion. Your content is setting its own standard which is very enjoyable. Keep up the good work guys. Can’t see how you can do that in 3 actions? Can you explain to me how this is 3 actions? I feel like the it’s 4? activate, resolve focus, resolve another focus, resolve damage dice?